Forget silly gadgets and dodgy bottles of spirits. Wine people like to be given wine. And wine books. (Ange likes Hendricks Gin, by the way.) Here’s a list of this year’s best publications which you can still grab in time for Christmas, albeit not from us. Santa, Amazon..
All were published in 2012. £120 rrp, £77 on Amazon or elsewhere here. Fascinating for wine geeks but it’s probably not one for the casual reader and it isn’t in the bargain basement. As it says on the cover: ’A complete guide to 1,368 grape varieties, including their origins and flavours.’ (Can you name one of the 22 varieties that start with Z?) It’s hard to think of a more important or thoroughly researched opus on wine. I’m looking forward to getting to stuck in after Christmas. £35 rrp, £31.50 on Amazon. 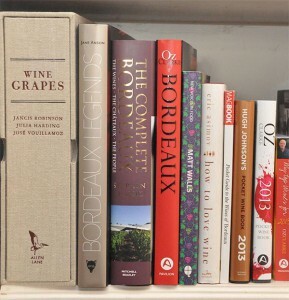 We loved this stunning book on the Bordeaux First Growths by our friend Jane Anson, the Bordeaux correspondent for Decanter magazine, so much that we pre-ordered 35 signed copies for Bauduc Bondholders and Club Members. We were totally oversubscribed in the space of two days. It won’t be available in the UK until the Spring, so we’ll keep you posted, but it’s only fair to include it in our list of favourite wine books from 2012. £45 rrp, £29 on Amazon. First published in 2007, this hardback has been updated and revised in 2012. An essential reference book on Bordeaux, it’s a cracking read too. Fantastic value at the discounted price. £25 rrp, £21.50 on Amazon. Again, this hardback has been revised and updated in 2012. If you haven’t got the 2008 edition, this is certainly worth putting on your list. £12 rrp, £8.96 on Amazon. If this book is for beginners, then why have I read it from start to finish? Because Matt Walls writes brilliantly. A really good introduction to wine. £17 rrp, £10.90 on Amazon. Eric Asimov is the ’chief’ wine critic for the New York Times (as he says, he’s the only one) and this is a fascinating ‘memoir and manifesto’. An absorbing interpretation of wine – if you like reading about the stuff, do put this on your list. £6.99 rrp, £6.29 on Amazon. Chris Kissack is a doctor in the NHS, hence his website ’The Wine Doctor’. This is his first book, in a format called Magbook. Certainly one for the stocking. £11.99 rrp, £6.50 on Amazon. The perennial favourite. These books come out so early they seem a little out of date as far as vintage reports are concerned. Still, a deserving leader in its class. £11.99 rrp, £5.28 on Amazon. Another pocket guide, and a very good one. Great value for the stocking. £7.99 rrp, £5.50 on Amazon. We’re not in this, in case you were wondering, but Oz’s view of what’s good in the world of wine is always worth reading. Now, time to order that book on Pomerol from Neal Martin. Direct from the author, allegedly. If I’ve missed any books from 2012, do post a comment below. This is very nice and informative article & thanks for sharing the useful informative books.I am really happy for this article.